This DG Extension tube set has upgraded "Gate-Array IC" circuitry to work better with digital SLR's and some of the digital SLR lenses, like the Nikon DX (e.g. 17-55mm, 10.5mm) digital-only lenses. The Kenko Auto Extension Tube Set DG is compatible with Nikon DSLR cameras and F-mount lenses and is optimized to work with Autofocus lenses. Kenko's Auto Focus extension tubes are designed with all the circuitry and mechanical coupling to maintain auto focus and TTL auto exposure with most Nikon lenses given there is enough light (at f/5.6 or brighter) to activate the cameras AF system properly. Auto Extension Tube Set DG for Nikon Lens is rated 4.4 out of 5 by 364. Rated 5 out of 5 by Anonymous from Must-have for budget macro I have been a big extension-tube fan for years- and when I just bought a Nikon D90 the availability of this set was a key factor in my decision. I do a lot of nature macro work and use these on my zoom lenses. Oh- are they SWEET with the Nikon 18-55 and 55-200. The secret to using them with zoom lenses is that your zoom control is now a coarse focus control and the regular focus(autofocus) is a fine focus. Using these at shorter focal lengths is great for static objects like barkscapes; longer focal lengths are great for getting insects from a distance. I use an off-camera flash in low power mode to avoid any motion blur. Rated 5 out of 5 by Del from Lotza Fun!!! Numerous photog friends of mine do great Macro work and, interestingly, they all crow about using these handy, inexpensive Kenko extension tubes to perfect the image output from their various macro and non-macro lenses. The purchase of these tubes will peak your interest in macro-photography, as you can use them with most of your existing lenses. So far, I've shot both my Nikon 50mm 1.4 prime and my AF-S Nikkor 28-300mm 3.5-5.6G zoom @ 300mm on my D600, using mostly all three tubes at once. The end results are outstanding. These tubes are a great precursor for any further steps you might explore to get seriously into macro-photography. Rated 3 out of 5 by David from Is it just mine, or is there a problem?? When I first used these tubes one at a time I thought they were fine -- autofocus worked as if there was no extension. However, when I tried two tubes together on a Nikon 300mm f4 camera D800, I started getting the fEE message showing that I had lost auto diaphragm. Nothing was moved on the lens so it had to be something in the tubers. I took off the one attached to the body, reattached and it started working again. The same error message happened again and the same solution worked, but if this happened at the wrong time it would be a serious problem. The tubes seem to have a little play at both the body and lens mounts. Never had this with the Nikon tubes, but they don't allow autofocus. Rated 4 out of 5 by Anonymous from They work well, are nicely built I got this set a couple weeks ago after months of itching to try macro. They work as intended, and deliver gorgeously sharp images depending on your technique (and lens). They're also well built and durable. I removed a star simply because I think the price point is a little ridiculous for what they are. Especially considering that auto-focus is very unnecessary in macro (it's very slow and any movement by the subject or the camera moves the focal plane). But if you want to delve into the world of macro photography without purchasing a dedicated macro lens, they are possibly the best extension tubes out there. All in all, I would recommend them. Rated 5 out of 5 by PabloPicasso from Best Choice for Extension Tubes These are reasonably high quality extension tubes allowing you to focus on objects that are close. They are particularly useful on larger focal length lenses (I am using a 55-200mm zoom) to get outstanding closeups. I made the mistake of ordering Nikon's PK13 which is not compatible with DSLR's - no electrical connection from lens to the body - and Nikon doesn't make extension tubes for modern lenses. I replaced it with the Vello extension tube set, but a quality issue prevented the ones I got from locking, so the camera didn't think there was a lens mounted. The Kenko extension tubes work perfectly, and are worth the extra money for the quality, and less expensive that a true Macro lens. Rated 5 out of 5 by Anonymous from Awesome shots of snowflakes.... Used all three Kenko tubes on my D800 together with 60mm prime lens for my first attempt at shooting snowflakes. I wasn't satisfied with my first set of images; but, I discovered it wasn't my set up, it was the quality of the snowflakes. The last snow showers of Jonas consisted of the large, fluffy-type snowflakes which are the most photogenic. The image attached was from Winter Storm Jonas 2016. It was a hand-held shot at f13 ISO 2500 1/125. Can't wait to try this setup out on insects and flowers come Spring! Rated 5 out of 5 by macro photo enthusiast from Great service for a good product Personal research brought up the Kenko Extension tubes again and again as a reliable product that can be used with various lenses. My order arrived in excellent time. I have tested the tubes in various settings over the past week. I find the Kenko extension tubes (individually, paired and all three together) are most useful with the kit lens set to manual. Using a tripod is a must to stablize the camera. The tubes fit tightly together and are sometimes a little difficult to separate. The metal contact rings are sturdy and attach easily to the camera body. I am pleased with the images I have captured so far and will definitely use the tubes regularly to explore close up photography! I returned one set of Vello tubes and am having pretty much the same problems with the 2nd set. With all 3 on a 200mm macro Nikon lens, I get FE for aperture. And there is vignetting with the tubes. Put on a 300mm 2.8 lens, it tries to focus but never locks. Does the Kenko set have the same reduced inner diameter that causes vignetting and are they likely to have the same problems? The Kenko Auto Extension Tubes have a reduced inner diameter, however they will not cause vignette when being used. Do these work with the Nikon D850? Yes, the Kenko Auto Extension Tube Set DG for Nikon Lens, B&amp;H # KEAETSND, may be used with the Nikon D850 DSLR camera. Will this work for my Nikkor 70-300mm VR lens and Nikon D7100 body? Yes, the Kenko Auto Extension Tube Set DG for Nikon Lens will be compatible with the Nikkor 70-300mm VR lens and Nikon D7100 body. The Kenko Auto Extension Tube Set DG for Nikon Lens is constructed with metal mounts and plastic tubes. In the product reviews mention is made of both a plastic and a metal version of these tubes. If this is correct, what are these. I mean I'd buy genuine Nikon usually and stick to well built metal parts even if heavier but it does seem in this case these independent tubes are a better choice for the modern FX DSLR world where aperture rings on lenses are non existent in G series) and having the option of using AP modes with matrix metering is preferred. The Kenko Auto Extension Tubes are plastic with metal contacts. 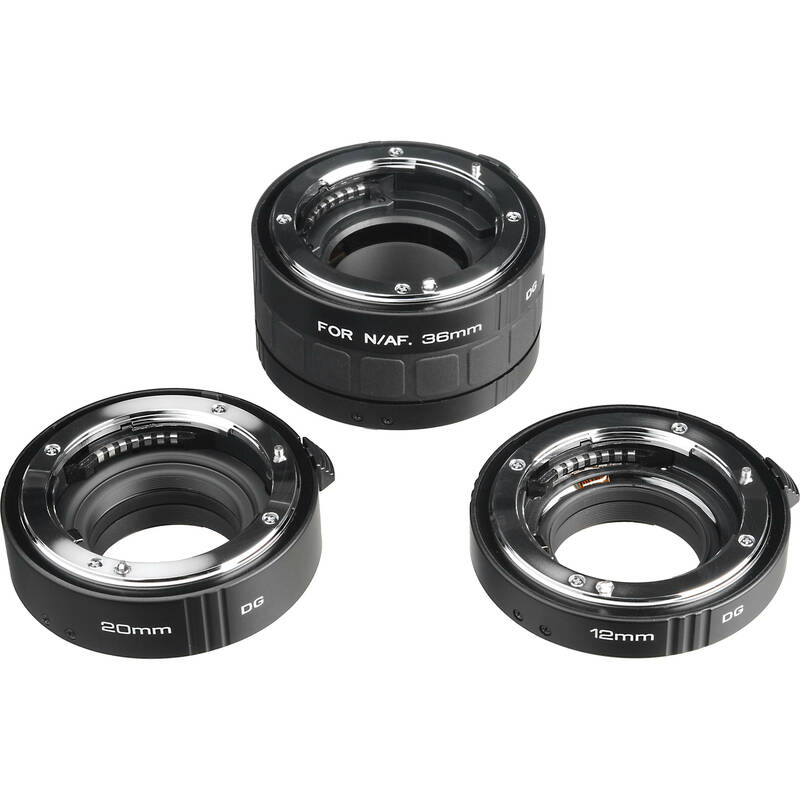 Will these extension tubes work with a D750 and a SIGMA 50mm f/1.4 Art lens ? I only use Nikkor glass, but, if thr Sigma lens uses the Nikon pin-out, I can't imagine these wouldn't work. They've been a fantastic addition to my kit and are both cheaper and les weighty than buying maceo lenses. I use them on a 7200. Should work on a 7100. How is the image quality using those Extention Tubes vs a micro lens? In other words, does the tube degrade image quality vs bare lens? A real macro lens has some advantages over a &quot;standard lens&quot; and extension tubes. If your subject is perfectly flat (a postage stamp, for instance), a real macro lens (one designed to focus 1:1 scale or close to it) will be sharper in the corners. If the subject has depth (like probably 99% of the stuff you take pictures of with a macro lens), then you NEVER have enough depth-of-focus. If you want even a few millimeters of the subject in focus at 1:1 scale, you need to set the lens to a REALLY small aperture. My Nikon macro lenses have an f32 setting. Most standard lenses can only stop down to f16. f32 is a big advantage. Using an extension tube to increase magnification just increases your need to use smaller and smaller apertures to keep anything in focus. BUT... a 50mm to 100mm prime lens and ext. tubes is still a great way to get high-magnification shots. You would have to take a lot of close-up images to justify the difference in cost between tubes and a real 105mm macro lens. I would certainly just use tubes and a 50mm lens while saving up for a 105mm macro. Don't waste your money on a macro shorter than 100mm. The extra subject to lens distance you get with 100+mm focal length is really important to good subject lighting, among many other things.